This week (April 24th-30th, 2011) is National Infertility Awareness Week; and honestly, I've slightly been putting off this post, just a bit...mostly because I don't even know where to begin. I never, ever thought that I'd be dealing with infertility. Ugh, I've really come to hate that word. IN-FERTILE. Such an ugly label. It's not that I didn't realize that TTC could take time or effort; I just didn't realize that it would take us years of heartache and struggle. But here we are, 2 years later...still "fighting the good fight". The National Infertility Awareness Week website is asking bloggers to write this week about common myths about IF and how they have affected our lives. This is what I mean by "I don't know where to begin"...so many myths have been shoved in my face and Mr. C's face and perpetuated by people who honestly have NO clue and have NO right even speaking on the subject. It's hard to pick just one myth; so, I've chosen to post some of the "busted myths" from RESOLVE'S NIAW website. You can read them all here. Myth: If you just relax, you will get pregnant. Busted! : If only it were that easy! The fact is, the vast majority of individuals who have infertility have a medical reason, not a stress-related one. Upwards of 90% of all infertility cases are caused by physical problems. In the female partner, the major causes of infertility are absent or irregular ovulation, blocked fallopian tubes, abnormalities in the uterus, and endometriosis (a chronic painful condition where tissue from the lining of the uterus migrates into the pelvis and attaches to the reproductive organs). The male partner can have issues with sperm production which can lead to too few sperm, sperm which can’t swim correctly, and abnormally shaped sperm. Where the stress/infertility connection may come in tends to be after one has been trying for a while, and the stress of not conceiving easily may then contribute to the problem. But there has never been a study which shows that simply relaxing increases pregnancy rates. Research does show that infertility patients who learn and practice a wide variety of stress reduction techniques can have higher pregnancy rates than patients who don’t learn those techniques. 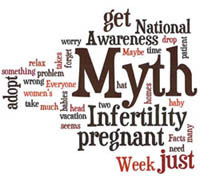 Myth: Something you did caused your infertility (you are too fit, too fat, ate the wrong food, had a STD…). Busted! : There are few lifestyle factors which permanently impact fertility. Smoking can be one of them, but many people have stopped smoking and been able to conceive within months. Obesity, and being underweight, are both associated with an increased risk of infertility, but losing or gaining weight can relatively quickly bring you back to the fertile zone. Eating unhealthy food can put you at risk for diseases such as heart disease and cancer, but switching to a more healthful diet- focusing on fruits and vegetables, whole grains, lean meats, and dairy products are associated not only with a lower risk of disease but may increase one’s chance of ovulating normally. Once again, if you know that you want to have children, it is indeed a good idea to look at your health habits and if you have any which might hamper fertility, such as smoking, excess alcohol intake, being over or underweight, extremely vigorous exercise habits, or a big caffeine habit, adapting healthier habits can decrease your risk of experiencing infertility. Busted! : This is a myth! Adoption does not guarantee or ensure pregnancy, and it should not be used as a means to try and get pregnant. Pregnancy is a biological process, and a couple can not determine if and when they will become pregnant. MYTH: You will have multiple babies (high order multiples).Busted! : It is true that fertility treatment increases the risk of having a multiple pregnancy. However, most twins result from spontaneous conceptions -- couples who conceive on their own! Triplets or more are a different story; approximately 15% of triplet and 7% of quadruplet pregnancies were conceived spontaneously. Busted! : Though we would like for all individuals and couples trying to get pregnant to be successful, unfortunately, there is no fertility treatment, including in vitro fertilization (IVF), that always works for everyone. The likelihood of success in an IVF cycle is impacted by a number of factors, the most important being the age of the female partner. Information collected from almost all of the IVF programs in the country found that women under 35 had a 41% chance of having a baby from a single IVF cycle. The chance of success drops to 32% in women between the ages of 35 to 37, and 22% in women between the ages of 38 to 40. That number is even lower in women over 40 years of age. Success rates also vary with the number of embryos transferred; the likelihood of pregnancy increases with when more embryos are replaced, but so does the risk of a multiple pregnancy. The chance to have a baby from IVF increases when more than a single cycle is done. Though not everyone who undergoes IVF treatment will have success, the majority will! Myth: A higher-power is telling you that you should not be a parent. Busted! : Infertility is a disease of the reproductive system. It does not discriminate and affects all races, religions, men and women equally and people all over the world. Whether or not you resolve your infertility journey by choosing to become a parent is a function of your determination and not a higher-power. Parenthood is attainable, if that is truly your goal. You may or may not be fortunate enough to have a biological connection to your child, but if you want the experience of being a parent, you can achieve that dream. People who choose to be childfree after infertility have examined the avenues to parenthood, considered the advantages and disadvantages, and decided that being a family of two is also a blessing. That last one has been the most hurtful to me and Mr. C. We trust God implicitly to guide us through this horrible journey of IF toward success. We don't want to hear how you think that God is telling us that it's not meant to be. We're trusting him for the EXACT OPPOSITE. I hope that more and more people will begin sharing their IF and TTC stories with friends, family, and other communities. IF affects thousands and thousands of couples (one in eight is the number thrown out often, but who really knows since 61% of all infertiles don't tell anyone that they're going through IF). Nobody wants to talk about it. I think this causes a massive amount of shame and loneliness for those who are struggling. Oh, if only they knew just how many others out there - across the street, in their church, in their workplace - were going through EXACTLY what they were! I don't share my story on here because I enjoy being vulnerable or because I like the sound of my own "proverbial" voice. I tell my story; so that maybe, just maybe all of this pain and suffering and struggling to conceive will have a purpose - to help others who are struggling just like me, to reassure them that they are not alone. I sincerely pray that time will heal all wounds and that everyone grappling with IF will have their prayers answered and the desires of their hearts met.